Artichokes are considered a cool season crop but can be grown as a perennial in Santa Clara County. They require lots of sun, plenty of water, and occasional protection from frost. Two crops per year can be expected. After spring harvest, cut off the old stalks just below ground. New shoots will develop and produce a fall crop. Each flowering stem produces one large artichoke at the tip and several smaller ones below. Harvest the central bud first, when scales are tightly closed and the globe is about the size of an orange. The stem should still be supple 2 inches beneath the globe. 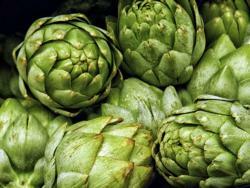 Avoid artichokes that have already begun to open as they will be tough in texture. Artichoke plants reach a height of 3 or 4 feet and a spread of up to 6 feet in diameter, so allow plenty of space for them to grow. Don't plant them near tree roots, as they don't compete well for nutrients and water. Artichokes have an appetite for nitrogen. When planting, mix manure, compost, or other organic matter into the first foot of soil in about equal volumes. During the growing season, the artichoke needs to be irrigated about once weekly. Artichoke Violetto Precoce, OP Mid-early violet purple artichoke with medium-sized, thorn-free globes. Tight, thick leaves are deliciously meaty yet tender. Very traditional Italian variety. Green Globe Accounts for over half of the artichoke production in California. Sharp spines with large, heavy, consistent-quality, globe-shaped heads. Also known as Vert Globe. Imperial Star Grows 3–4' tall and bears 3 to 8, 4-inch-diameter spineless buds.